Mark Bittman is revered for his simple, straightforward, and flexible approach to everyday cooking. In Dinner for Everyone, he shares 100 essential main dishes, each with easy, vegan, and all-out recipes as the mood or occasion requires. These 300 all-new recipes, accompanied by more than 100 full-color photographs, form a diverse collection that includes quick meals for busy weeknights (hearty soups, tacos, and one-pot pastas), creative plant-based fare that will please both vegans and non-vegans alike (lemon polenta with mushroom ragu, pomegranate-glazed eggplant, or cauliflower tinga tacos), and impressive dishes perfect for entertaining (handmade noodles and even your Thanksgiving centerpiece). Whatever the experience level, craving, or time constraint, home cooks will find exactly what they need to prepare all their favorites with confidence and enthusiasm. 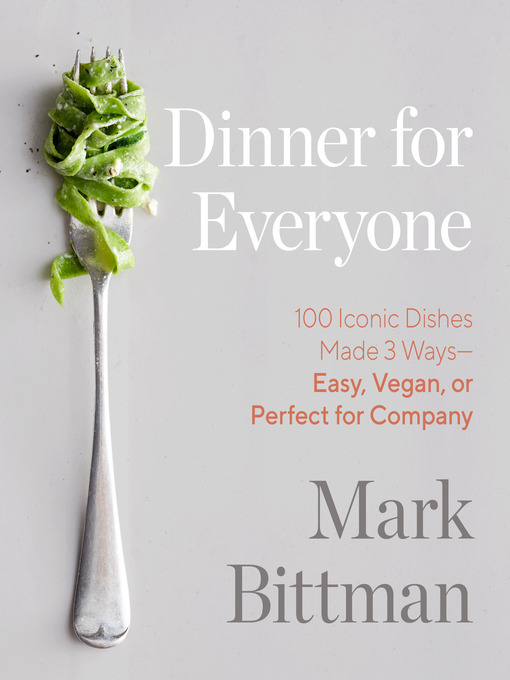 Rooted in Mark's philosophy of using efficient cooking techniques, fresh ingredients, and basic equipment—and written in his signature to-the-point style—Dinner for Everyone is a one-stop, indispensable reference for life's ultimate question: What's for dinner?